The Swedish nationalist organization Nordisk Ungdom, known for their colorful activism, has been banned from YouTube. Their well established YouTube channel with over 7000 subscribers and many millions of views has been deleted and it seems that it was their last video that led to that decision. Sweden is known for its welcoming stance on unaccompanied minors, but an often recurring critique toward this is that many of these immigrants are, in fact, not minors. Sweden has been reluctant to do medical or other tests to prove the age of these “children” and instead accepts the age the immigrants are telling themselves. So it has been kind of a standing joke with adult afghani men posing as children. Nordisk Ungdom coined the term “skäggbarn” (bearded children) several years ago in one such campaign to highlight the lies. Now finally Sweden has allowed some kind of rudimentary age controls and of course, no one was a child. But instead of letting the law has ist due course the parliament has accepted a panic law making it possible for 9000 of these proven adults (and proven liers) to stay. As a response, some bearded activists from Nordisk Ungdom and friends from an affiliated group named Myntttorgsaktivisterna went to stand outside of the parliament with pacifiers in their mouths and a sign saying they are 12 years old and named so and so under the overall message “Bearded children only half price” putting the finger on the hypocrisy concerning the children issue and the financial issue affecting taxpayers. YouTube is acting in a manner that is restricting free speech, and in Sweden, we now have an election year. That a private corporation finds it suitable to meddle in the political debate and advance a leftist agenda is terrifying and a direct threat to democracy as such. All men of good will must protest! We can´t accept this development! 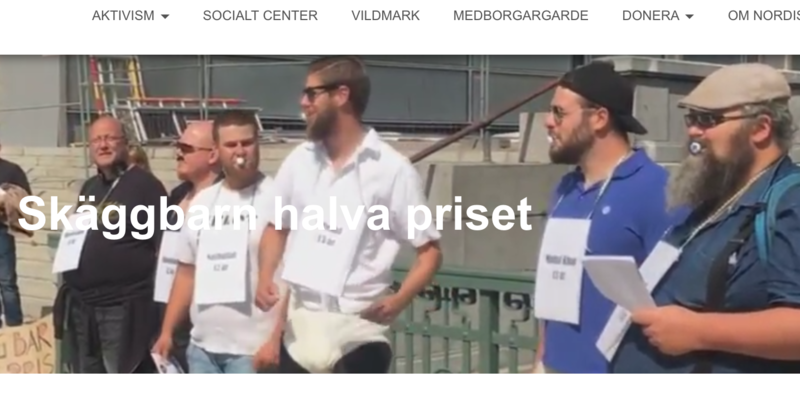 Nordisk Ungdoms has the last weeks been campaigning in another free speech issue by trying to create awareness in Sweden about the fate of Tommy Robinson. The overall picture of Europe that is starting to arise is worrisome, to say the least. Föregående artikelNordisk Ungdom censureras från YouTube!